John Bidwell was not only prophetic in his assessment of California agriculture, he was productive in making it a reality. Throughout his career he promoted the cultivation of all kinds of fruit and was continually planting out new orchards and experimenting with new varieties. I’ve been reading his diary for January-February 1871 and it seems that every day he and his workers were preparing or planting out another orchard. On January 18th he notes: Recd. trees from Robt. Williamson. Grape vines arrived from J.R. Nickerson. The next day: Hauled the Nickerson grape vines from Depot & heeled them in. The day after that he was in Sacramento: At Sacramento I went out to Capital Nursery & engaged White Muscat of Alexandria grapes – 2000 – also 50 Hales early peach. The following week (Jan. 23-27) goes as follows: Tuesday: Set out black walnut trees; Wednesday: Set out peach trees; Thursday: Set out apple & plum trees; Friday: Setting out apple trees. The man never stopped. Then on February 2nd: Set out 100 Bartlet Pears and other trees. 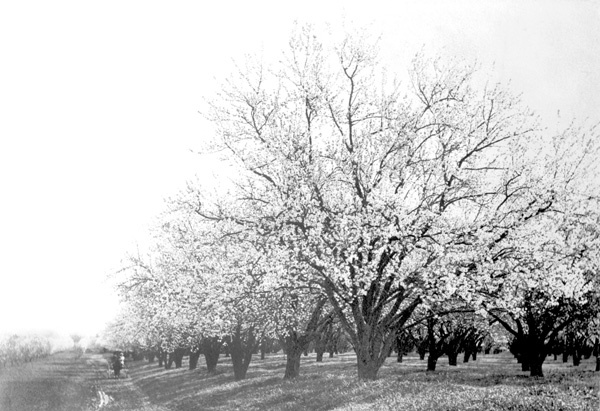 50 Hale’s Early peach – 50 Early golden apricot – 100 cherries, etc. If today in California we live in “one grand fruit orchard,” a good deal of the credit for bringing that about goes to John Bidwell. This entry was posted in fruit trees, Uncategorized. Bookmark the permalink.